A low-cost airline's decision to expand its flights from Cardiff Airport to Spain has been welcomed as a boost for business and tourism links. Spanish airline Vueling will will fly three times a week to Alicante and Palma, Majorca, from 22 June. Last year the airline announced a service to Barcelona starting in March. Airport bosses have urged the Welsh public to support the new services, after a decline in passenger numbers in recent years. 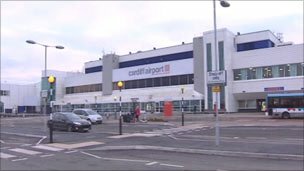 Cardiff has lost more passengers over the past three years than any of the other major regional airports in the UK. But Welsh Business Minister Edwina Hart said the announcement had the potential to significantly increase traffic, and was excellent news for the wider region. "It also opens up closer business and tourism links between Wales and Spain bringing benefits to both countries," she said. The flights to Alicante and Palma will operate on Tuesdays, Thursdays and Sunday. Airport managers said the new routes offered passengers the chance to access some of Europe's leading holiday destinations from their local airport. "In addition, the airline, which has a very high profile in Spain, will also give Spanish passengers the opportunity to visit Wales," said Patrick Duffy, the airport's managing director. Vueling's previous announcement last October of flights to Barcelona had come two days before low-cost airline Bmibaby halted its services from Cardiff. Neil McAvoy, deputy leader of Cardiff council, has said the Welsh government needs to secure new business routes out of Cardiff. He said the airport required routes to New York and Dubai, which would tie in with the new business district planned for Cardiff.